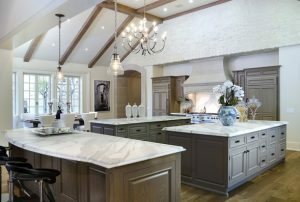 Celebrity kitchens are something that people would give anything for! Just looking at these kitchens will send you into a tizzy and increase your hunger pangs. To top it all off, they have the latest appliances, making their kitchens elegant beyond words. 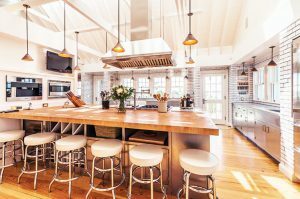 It is said that celebrities are knocking over one another to possess the top kitchens in Hollywood! 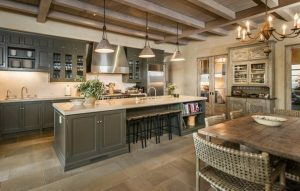 Here are the top 10 celebrity kitchens for you to drool over! As per TMZ, this kitchen captures your imagination with a certain wow factor! They haven’t yet bought this place, but it is well worth the mention. 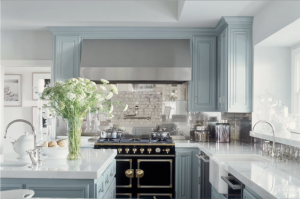 The Jay Z-Beyoncé kitchen is one of the swankiest kitchens yet and it can really drive you crazy! The kitchen is totally white everywhere and has a lovely view of the Los Angeles Skyline. This kitchen is part of their 85 million dollar home, high up in the Hollywood hills. The Lady Gaga’s kitchen fully qualifies to be in this list. 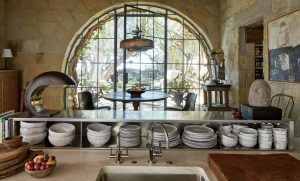 A European style kitchen, it is in her Malibu mansion. The place has a high ceiling and magnificent exposed beams and boasts of a pretty rustic finish. This kitchen is a favorite of the lady where she and her monstrous friends gather to sink their teeth into some delicious vittles. Billy’s kitchen is totally uptown and full of class. It is purely a chef’s kitchen. The ceiling is very high and reminds you of a cathedral. There is plenty of sitting room and a party of sorts can be hosted right there! Taking into account the flashy and eccentric lifestyle of Kanye and Kim, their kitchen comes as a surprise package. 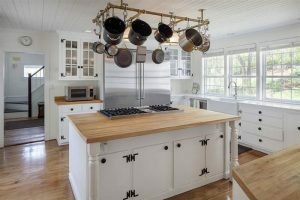 The French style kitchen is pretty simple to the eye, but yet it is very much there in the high end and is elegantly understated. This kitchen is in their Bel Air Hills mansion, which is only like eight bedrooms. Ellen’s kitchen is an old world charm with chairs styled like those of the 19th century. Situated in her Santa Monica ranch, this kitchen has a Danish lounge chair that catches your eye instantly. The light fixtures are all Italian. Going by Hollywood standards, the house is surprisingly cheap at 2.5 million dollars. 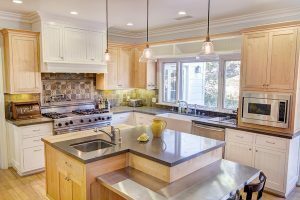 The one area that stands out in this house is the kitchen! It is of open design and is extremely gorgeous. The refrigerator is a really huge piece- perhaps they store a lot of food in there! 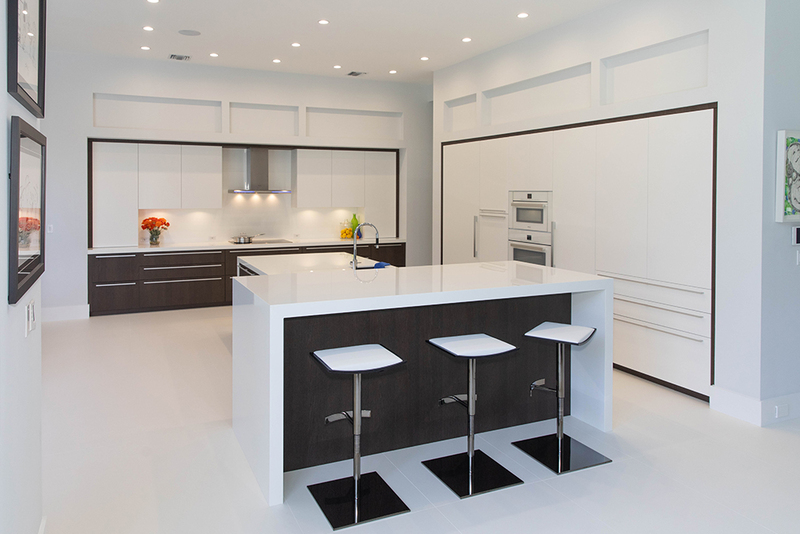 Jennifer’s kitchen is ultra-modern and chic. 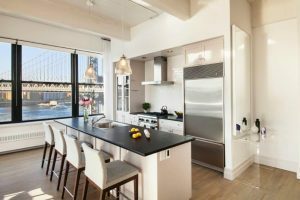 This seriously swanky kitchen is in her New York penthouse apartment. The most awesome thing about Anne’s kitchen is the view it provides! Otherwise, the kitchen is rather minimalistic and suits her just fine. But with a view like that, everybody falls for it! Renee has a stunning white kitchen which is completely high-tech. There are lots of pots and pans hanging around just over the island in fact, most of the stuff in her kitchen is hanging! Elton’s kitchen is all money and that’s about it. Vibrant colors- almost garish, is what catches your eye. This is in his Los Angeles home and perhaps suits Elton’s taste!